That an anarchist hesitates before some of the ideas and politics that animate the SAT (its “regional nationalism”, a sometimes heavy top-down internal organisation, with its parallel evocation of leaders, its celebration of work and the dependence on a broader capitalist economy for the functioning of its cooperatives, talk of “food sovereignty”: all of these are real or possible frailties not exclusive to the SAT, nor necessarily worse than those that sometimes afflict many anarchists and anarchist politics) is perhaps understandable; that s/he rejects or ignores their struggles would be ideological arrogance. The land occupations promoted and organised by the SAT would be impossible without the participation of other groups and individuals, as well as without the active support of broader segments of the population. The occupations are in other words expressions of social discontent and the desire to create social relations that break with the order of State-Capital. Where they take those involved, no one can predict. But what they do display is the courage do go beyond simple refusal and protest, and that it is possible to create the beginnings of something that aspires to a world beyond capitalism. There are 8 million hectares of agricultural land in Andalucía, of which 50%, that is, 4 million hectares, are in the hands of 2% of the land owners. Agricultural workers represent 43% percent of all workers in the autonomous region. The call, “The land to those who work it”, that has guided the struggles for land in Andalucía since the 19th century, is not a romantic anachronism. Today, the struggle for the democratisation of access to land and to food sovereignty in Andalucía is a question of the sustainability of life for all, beyond the struggle of agricultural day labourers. 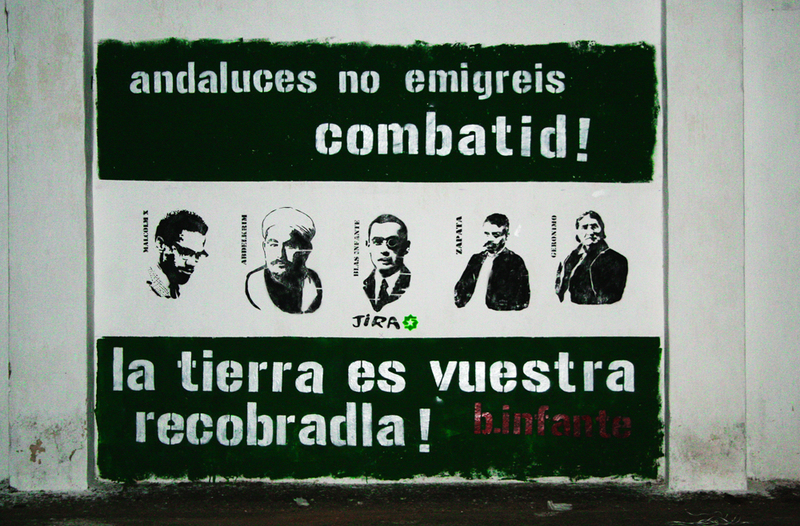 This time we want to present the reality of land occupations in Andalucía through two re-appropriations of common lands by Andalusian day workers [jornaleiras/jornaleiros]. The occupied estates of Somonte and Liberty Hill offer up a necessary example of struggle for land sovereignty. We spoke to comrades who today make possible the daily upkeep of these occupations and this is what they spoke to us of. What is happening in Somonte? 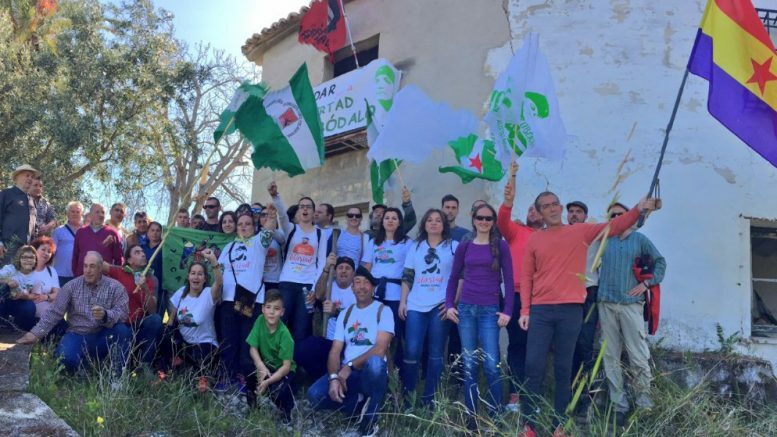 On the 4th of March of 2012, day workers from the Sindicato Andaluz de Trabajadorxs (SAT) occupied a 400 hectare farm in Palma del Río, in the province of Córdoba, to prevent the administration of the regional government of Andalucía from selling it off. Their aim was to alleviate the devastating regional unemployment of day workers. And thus was born the occupied farm of Somonte. If we could now take a look there, we would see, in yet another farming year, that all of the land has been sown. Something which, given its extension and the precarious means available, is no small feat. We are speaking of distinctive annual cultures, among which we would highlight autochthonous varieties of wheat. For the cereal campaign which is coming to an end at this time (the present text was written in early June), we planted more than 20 hectares of local varieties of cereals at risk of extinction, thanks to popular support for the project through a crowdfunding initiative. The harvest was concluded a few days ago and we can already say that it was a success, especially in a year that has been good for cereals in the whole peninsula. So far for the present, but given that every seed is a promise, we want to continue (we hope) with what will happen soon in Somonte. The next autochthonous cereal campaign will reckon with a greater surface to sow, given that this year’s harvest is going to be used, almost exclusively, to multiply seeds, that is, we are not going to sell the harvest this year so that we can continue to extend their cultivation in the next campaign. We will be able in this way, in a handful of years, to sow a considerable quantity of hectares of autochthonous cereal ecologically. Moreover, we are working on the possibility of collaborating with a scientific institution interested in carrying out here some experimental ecological agriculture; the vegetable garden will continue grow with the beginning of the agricultural year and we hope, though over time, to realise and develop some other project among the many that we have in mind. What is happening at Liberty Hill? Following the example of Somonte, on the 1st of April of 2017, when Andrés Bódalo was completing one year of an unjust imprisonment, the SAT occupied the Adarves Altos estate, on the slopes of the San Cristóbal Mountain, only 6 kilometres from Jaén. After occupying the land, it was re-baptised as Liberty Hill, in recognition of our imprisoned comrade and for the demand for his immediate release. The estate of 73 hectares (63 of which are planted with olive trees) was the property of the SAREB, the so called “bad bank”, and is currently owned by the BBVA (Banco Bilbao Vizcaya Argentaria). What would we see if we were to pass right now through Somonte and Liberty Hill? If you were to go by Somonte just now, you would see sunflowers in full bloom, mature chickpeas and a great many hectares of cereal recently harvested. At the right time, you would be able to see loads, tons, of autochthonous grain that begins to be winnowed and bagged, waiting for the next planting season, that we will begin in the Fall. You would also see how the first fruits of the summer garden are growing or how the corn is doing that is destined to feed the chickens, or the experiment we are carrying out with groundnuts. While at Liberty Hill, we are engaged in a complete exercise of recuperation. In this instance, we rehabilitated a house that was half in ruins, and which today has a common room, different bedrooms where some 10 people live, a storehouse, a kitchen, a bathroom … A one hectare garden was planted where there was only scrub before and a horse stable was built which is today home to Mariano and Susana (our Iberian pig couple), rabbits and chickens. We cleaned up the more than 6500 olive trees that there are, having removed twigs and pruned more than a thousand. What is intended with the occupation of Liberty Hill? What we are calling for with our action, which has been going on now for three months, is that the land cannot remain abandoned while we are consumed by unemployment, apathy and anxiety. We call upon the regional government to comply with its own law, given that until now it has ignored the demand that we presented, namely that it apply the Law of Agrarian Reform of 1983 that stipulates that a farm abandoned for more than two years is susceptible to expropriation such that it may satisfy a social labour. We demand that the land must stay alive and that for this it has to be made diverse; to put an end to mono-cultures and diversify our fields. Our project thus includes livestock, the cultivation of almonds and pistachio, the garden, etc. We demand that we should be free and that our land should be free so as to be able to live freely in harmony in and with it. We demand, want and feel that one cannot own land, that it belongs to the people that inhabit it. Land is neither to be sold or bought; it is to be managed by those who care for it and work it, which are the hands of peasants and day workers who have worked it their entire lives. This is dignity, future and hope, this is Liberty Hill. What continues to be defended in Somonte? Firstly, the occupation of Somonte (already five years ago) had as its objective to show that the regional government of Andalucía sought to sell, yet again, one of the farming estates that it had earlier expropriated with the aim of responding, even if timidly, to the secular demand for an agrarian reform that, let it be said, never went beyond its first stages. Secondly, it was a direct action that made land available to those who work it. Since then, all of the effort has been directed towards creating cooperatives that can take on the production of food items and, in a second phase, to transform them on the estate. The effort is enormous … How does Andalucía, the world, benefit from the Somonte project? In Somonte, we want to make real, and we are doing so, the old demand for workers’ self-management and job creation, once the means of production are socialised, and the just distribution of wealth that follows from this. On the other hand, this management cannot be acritical; we cannot limit ourselves to self-managing the world as we find it. Even more so in our case, for we are not dealing with any means whatsoever. We are talking about land and food, the basis of all human community; we are talking about our metabolism and its environment, of our relationship with nature. Our labour in Somonte therefore seeks to go further and we work to make real the food sovereignty of people, with all that this implies, both inside Somonte and outside. Inside: recuperation of soils, fertility, biodiversity, forgotten local varieties (it is estimated that some 90% of these varieties have been lost). Outside: development of local consumption of the wealth here produced, thereby favouring local cycles within a local ambit, and fortifying and extending already existing networks of production and consumption. But not everything is budding sunflowers … What things are making the project difficult? Obviously, all of the problems inherent to an okupation: instability, uncertainty, alegality, etc. To which must be added that it is not sufficient to liberate a farm; rather costly means of production are necessary (tractors, farming implements, machinery), even more so with the dry lands of Somonte. Little by little, with effort and consistency, we are managing, and thereby increasing our capacity to act. And the effort at Liberty Hill, in what way does it benefit Andalucía and the world? We believe that one cannot speak of a Leftist transformation of Andalucía if one does not consider and place at the centre of attention the problem of land. And one cannot possibly speak of such a transformation promoting budgets that sell off public land, or laws that liquidate the social function of land, converting it into pure merchandise. With this project, we put into practice the idea that the land is for those who work it, without waiting for governments that promise much and do little. With the occupation, we push the authorities and society to position themselves, because no one can remain neutral when a conflict of interests is produced, whether with the banks or with the people. What things are making it difficult? At the Hill, as in Somonte, we confront two types of difficulties. On the one hand, the Guardia Civil, that dedicates itself to denouncing us, passing by the estate, and including during days of voluntary work with a mobilisation of eight police vans so as to frighten and threaten those who participate with the crime of “temporary occupation”, thereby ignoring their own laws, given that the case is in court on the accusation of permanent occupation. On the other hand, the BBVA , which not only refuses to negotiate with us any kind of handover or agreement, but has taken the matter to the police, accusing 20 comrades with the crime of “usurpation and damages”. Judgement will be rendered by the court on the 23rd of June. And lastly, the regional government of Andalucía, which could, according to its own statute of autonomy, expropriate the land that has been abandoned for more than two years, as we have asked. Dear comrades, what things have we learned on this path and why is this occasion ours? Somonte is already five years old and an okupation of this nature has shown, I believe, that it is not sufficient to put into operation a means of production, but that conviviality is also necessary (one not only works at Somonte, one also lives-with [se (con)vive]). That is, an okupation such as this one needs to work on all of the levels of daily life, not only on that of production. With this in mind, I believe that we are better prepared to meet the current challenges. We are in the struggle; we lack neither desire nor will, neither ideas nor projects. I am confident that within a year we will meet again in these pages to talk about new achievements and new challenges that we will pose. The first is occupation as a school in which are learned values, dynamics of management, the recuperation of agricultural knowledge, collective labour; it is a space where knowledge flows thanks to the different generations and different social movements present. We can say that it is a school at the level of agriculture, politics and life. Secondly, and tied to the first, that alliances are fundamental and that they should develop and are developing with movements struggling for dignified housing and against the banks, like the BBVA, with movements for food sovereignty which struggle as we do so that the land is for those who work it, with the movements of the unemployed who mobilise themselves such that work exists, and with the youth of Andalucía, who can come to see that immigration is not the only response to the crisis, that through mutual aid and cooperativism there is a future in this land. Thirdly, the demonstration that it is possible to care for a farm, in this case, of 75 hectares, based on self-management and mutual aid. Without a single public Euro, the farm is working better now than it ever did during the 5 years that it was abandoned by the BBVA. It is a practical demonstration that there is a non-capitalist way out of the crisis. Somonte Vs Monsanto. Todavía se puede consultar la información: https://www.goteo.org/project/somonte. This entry was posted in Commentary and tagged Land Okupations, Sindicato Andaluz de Trabajadores/as, Somonte. Bookmark the permalink.